Celebrated in Tamil month Aani (June-July) in order to rid the accumulated impurities. In that day sanctum sanctorum is being cleaned, specially made herbal oil prepared in the temple is being applied on Periya perumal. Namperumal and Goddesses golden plates (Kavacham or Angil in Tamil) are being cleaned by goldsmith. More priests and devotees visit to Cauvery to take holy water in Gold and Silver pots. Gold pot is brought over the elephant. Gold pot has been donated by Vijayaranga Chokka Nayakar in 1734. In meanwhile it was looted by some robbers, then by gods grace it was recovered. This inscription has been engraved in Telugu language in this gold pot. 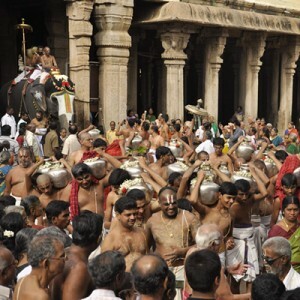 More silver pots being filled up with Holy Cauvery water and brought to the temple. On the way from Cauvery to temple Vedas are being recited. Then pots are put in the Western side, all the idols installed in “Thiruvennaiyali Praharam”. Golden plates removed from the idols and handed over to Jeer Swamiji and Vadhula Desikar Swamy. Then plates are being cleaned by goldsmith. After public worship plates are being fixed up in evening. Celebrated in Tamil month Aani (August –September) dedicated to the sacred thread worn by the Lord and for removing blemishes in daily rituals. First day the 365 times thiruvaradhanam is conducted to the utsavar in yagasalai and in the second day 1008 times thiruvaradhanam is condutced in the sanctum sanctorum for all the deities and are fully covered with holy thread which is named as boocandi sevai(Angobanga Sevai). This festival is to rectify the defects happened in daily poojas performed to Lord. 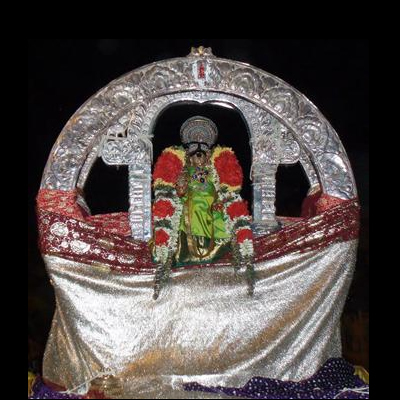 This festival being conducted in Cheranai vendran mandabam alias Pavithra mandabam. This mandabam was established by Jadavarma Sundarapandian. After Muslim invasion Lord and goddesses entered after 60 years in 1371. Sanctum sanctorum goddesses installed in the above mandabam. This function first started by Brahma. Due to this festival Holy Cotton thread Garland (pavithram) being worn to all idols. Lord Krishna’s birthday being celebrated in all Krishna temples, which are inside of Sri Ranganathaswamy temple campus. Particularly in Kili Mandaba Krishna temple, that idol Krishna with his parents, father Nandagopan, his mother Yasodha and Rohini will be installed in presence of temple. Sacred water is being poured. Krishna and Namperumal procession in the four Chithrai streets. Due this function Namperumal visits to Sri Pandaram. Their Thirumanjanam is being performed to Namperumal. Held in Tamil Month Aipasi (October-December) to remove possible blemishes in the Swing. This festival is known as Dolothsavam. This festival was started in 1489 by Kandhadai Ramanujar. Now it is celebrated 9 days festival. In 1st and 7th day Lord comes to cradle with goddess, remaining days god alone in the cradle. In the presence of Lord daily Arayar recites songs, Last day Lord visits to Chandrapushkarani, theerthvari being performed. Then Namperumal comes to Oonjal mandabam, Thirumanjanam being performed. Then night goes back to sanctum sanctorum. This oonjal festival commences eight days before Ekadesi during the dark fortnight of the month Aipasi. The last day festival comes on Ekadesi day. This festival is being celebrated before thirty days of Ekadesi. Lord comes to Santhana mandabam, Thirumanjanam is being performed. Then evening goes back to sanctum sanctorum. Again in night Lord comes to Arjuna mandabam. Here 365 poojas being performed. 365 garments are adorned to Lord. Kaisika puranam is being recited in Midnight. While return to Sanctum Pacchai Karpooram (Refined camphor) will be sprinkled, and then entered to sanctum sanctorum. 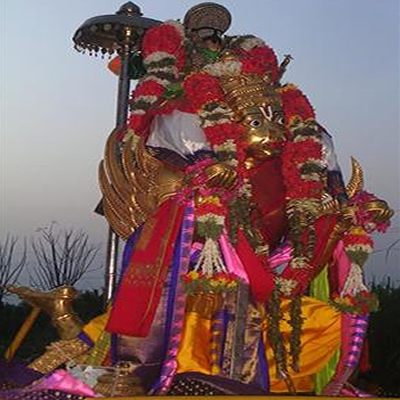 The most important festival celebrated for full twenty one days during Tamil month Margazhi (December-January), is divided to two ten days as pagal pathu and ra pathu, with all pomp and pageantry.On Ekadesi day, Lord Ranganatha, attired in splendid garment, proceeds in a magnificient procession through Paramapada Vasal, arrives at Thirumamani Mandapam in the Thousand in a pillared hall to the thrill and joy of the devotees gathered in lakhs who have come from all over India and abroad. This occasion is the peak point of all festivals conducted in the Temple, on this day of days; Sri Ranganatha becomes a virtual king and is known as Sri Rangaraja. He holds his Divine Durbar in that huge hall which is further extended by a specially erected and tastefully decorated pandal, throughout the day Nalayira Dhivyaprabandham is recieted, and gets back to the Temple only late in the night. Milling crowds of devotees constantly keep moving from dawn to midnight. Teams of devotees, engaged in non-stop bhajans, fast throughout the day and keep endless vigil during the whole night, singing and dancing to the beat of cymbals. Verily, it is the sight for the gods to see. A paradise on Earth indeed! Grand Festival in Tamil month Panguni (March-April), which can purify the professional blemishes. In the Vijayanagara dynasty one of the king name Viruppanna udayar established the Chithrai festival in 1383. After Muslims invasions Lord Ranganatha brought to sanctum sanctorum in 1371 (17th day Vaikasi month). In that time temple was under very much dilapidated condition. On 1377 the King Viruppannan donated Seventeen thousand gold coins for renovation of temple. In the year of 1383 after renovation Chithrai festival started after 60 years. Viruppannan handed over 52 villages for Temple welfare. In 1383 Chithrai festival being celebrated nearest villagers thronged in the Srirangam. In this festival 8th and 9th days are being celebrated by villagers very much. Villagers used to donate more number of cattle and cereals from their fields. This festival starts eight days earlier to Revathy asterism. The Chithrai car festival is being celebrated on that day. The Vishvaksena (Chief of the Lords’army) and Anjaneya brought to the Thayar sannathi accompanying some priests. They perform poojas under the Vilva tree sand some priests go to the river bed to take sand with “BHUSUKTA” both sands are mixed in the stage of moisten kept in the pots. Seeds are sowed in that pots and then kept in Yagasala. Within few days it gets sprouted. Vishvaksena is being brought to all the four Chithirai streets. He inspects the entire four streets before Lord Visits. This inspection is to ensure that there is no untoward incidents happened. It called as Nagarasothanai. In the first day the flag (Garuda picture drawn in the Canvas cloth) is brought to the four Chithirai streets in early morning. Then it is hoisted in the presence of Lord to indicate temple festival going on. After the flag hoisted Lord is brought to the Mirror Chamber (Public worship can be allowed only in 1st and 7th day of the festival). 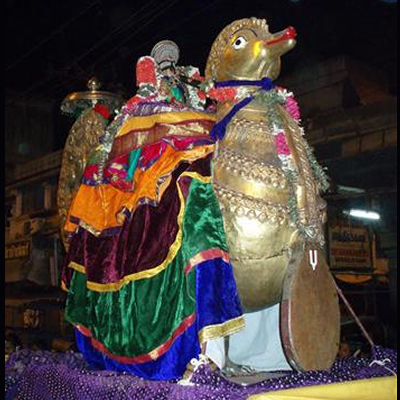 In the evening the Lord with Ubayanachiyar brought to the Chithirai streets. In presence of Lord Poigaialwar songs are being recited. Namperumal is being brought in Palanquin in four Chithra streets in morning. 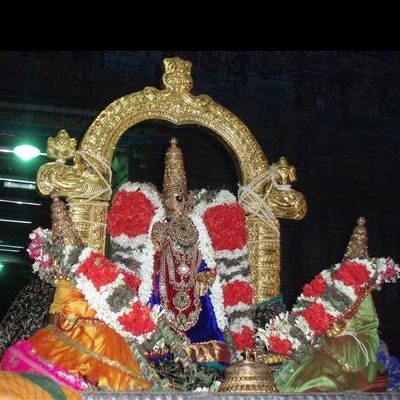 In the same day evening Namperumal comes in Karpagavritcham (A wish yielding tree) vahana in four Chithra streets. In presence of Lord Boodhathalwar songs are being recited. In Morning used Leonine (Simha) Vahanam and evening in Yali (Imaginary animal) vahanam. In presence of Lord Peyalwar songs are being recited. Morning Namperumal brought in Double prabha vahanam and in the evening in Garuda vahanam. In presence of Lord Thirumazhisaialwar songs are being recited. Morning Namperumal brought in Serpentine (Sesha vahanam), evening in the Hanumantha vahanam. In presence of Lord Nammalwar songs are being recited. Morning Namperumal brought in the Hamsa (Cygnet) vahanam, and in the evening coconut water being offered to Lord then Namperumal being brought in the Elephantine vahanam. In presence of Lord Nammalwar songs are being recited. In the morning devotees allowed to have seva in the Mirror chamber. In the evening Namperumal with goddesses visit Thirukottaram (Granary) heaps of paddy being verified as a customary practice. 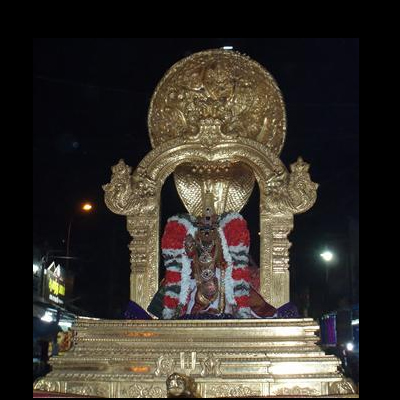 Then Lord takes procession in the Chitra streets and reaches Thayar sannathi Thirumanjanam being performed. Then reach the Mirror chamber in midnight. In presence of Lord Thirumazhisaialwar songs are being recited. In the morning Lord comes in the Silver Equestrian (Horse) vahanam. 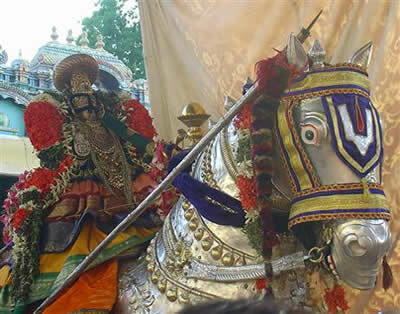 And in the evening Lord comes in the Golden Equestrian vahanam. When it comes near Chithra car shed unique event being witnessed, Namperumal seated on horse ridden in galloping speed. In presence of Lord Thirumangaialwar songs are being recited. Early morning Namperumal is installed in Chithra car, car being pulled in the four Chitra streets. 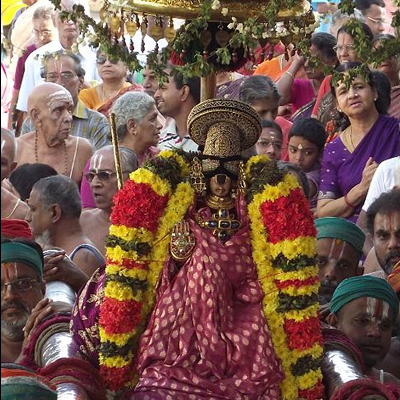 Then Lord brought to the Revathy mandabam, thirumanjanam being performed. In presence of Lord Thirumangaialwar songs are being recited. Morning in Sandhanu mandabam Thirumanjanam is being performed to Lord. In the evening Namperumal’s procession takes place in quite manner (avoiding musical instruments being used for the obvious reason) of Lord hearing Ramanuja’s songs. Namperumal visits to Ramanuja’s temple, there cordially welcomed by Ramanuja. And Ramanuja offers coconut water to Namperumal. After Namperumal offered it’s being offered to Ramanuja. Morning in Garuda mandabam Thirumanjanam is being performed to Lord. 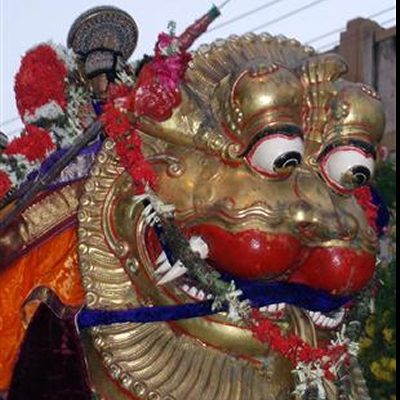 In the evening Namperumal’s procession takes place in the decorated palanquin with full of flowers rounds in Chitra streets. This festival narrates Lord will bless not only human being but animals also. An elephant named Gajendra daily picks flowers from a pond then it offers to lotus feet of Lord and prays without any expectation. Elephant is very much fond in this service. So it doesn’t ask anything from god Lord Vishnu likes the elephant very much. Unfortunately one day elephant’s leg was caught severely by crocodile while it picks flowers. Even though elephant is not able to tolerate the pain it feels worried the absence of service to Lord. It begs the Lord to do service continually, but it didn’t ask the Lord to relive from the pain and pangs. Lord rushed to the spot and pierced the crocodile and blessed the elephant. This incidental memorandum is being performed in the holy Cauvery river bed. Celebrated in Tamil Month Chithirai (April–May) in order to cleanse the impurities of the flowers used in adorning the Lord. Even though this festival being celebrated as a memorandum of Incarnation of Rama, In Srirangam being celebrated distinguishes. One of the alwar and disciple of Rama Kulasekaralwar made wedded lock his daughter to Ranganatha. This festival is being performed in Arjuna mandabam. 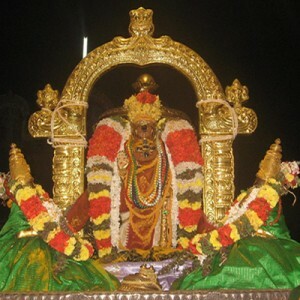 Lord Ranganatha and Cherakulavallinachiar (daughter of Kulasekaralwar) both are seated near and Thirumanjanam is performed to them. Celebrated in the Tamil month Vaikasi (May-June). In Vijayanagara dynasty the name of the king Annappa Udayar established Vasantha Mandabam in 1444. 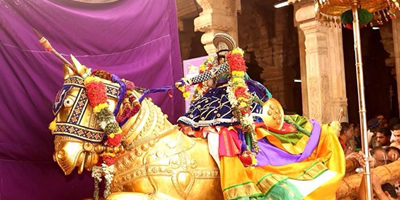 Mallidevan puthur village has been donated to conduct Vasantham festivals.Vasantham festival starts 8 days before Pournami (Full moon day) In Pournami festival comes to end Lord comes in Equestrian vahanam rounds in Chitra Streets then comes to Vasantha mandabam. Thirumanjanam will be performed in the vasantha mandabam. 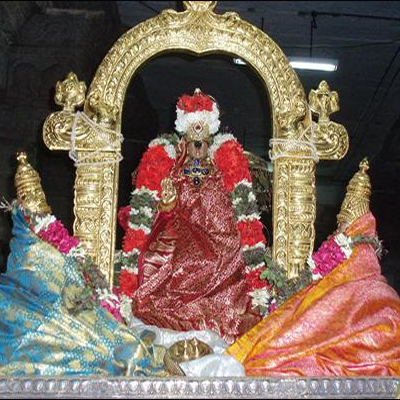 First and Seventh day of festivals Lord accompanies two goddesses visit to vasantha mandabam. Remaining days Lord alone visits the vasantha mandabam. When Lord comes back to sanctum sanctorum everyday he visits Kambar mandabam. Everyday alwar songs are being recited in the presence of Lord. In the Goddess Ranganayaki temple also the Vasanthothsavam is being performed.